Antony and Paul have the Month in X for September 2014 to discuss, but they still find time to hit the Renaissance Fair with Danger, Polaris, and the Scarlet Witch. Loyal X-Nation listeners know that this can only mean one thing-- road trip! 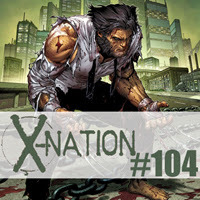 Month in X - September 2014 - Death of Wolverine #1, Death of Wolverine #2, Storm #3, Cyclops #5, Nightcrawler #6, Magneto #9, Magneto #10, X-Force #9, All New X-Factor #13, All New X-Factor #14, Wolverine and the X-Men #9, Amazing X-Men #11, X-Men #19, All New X-Men #32, Uncanny X-Men #25, and Uncanny X-Men #26.